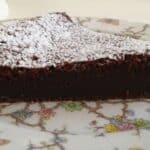 This year I have an outstanding edition to our usual Passover menu– Flourless Nutella Chocolate Cake. This chocolate cake recipe is the best cake I have ever made. It’s flourless, so it’s perfect for Passover. But don’t just serve it once a year. This cake is an impressive finish to any dinner party. What’s amazing about this cake is the texture. My friend Jody called it “Nutella cloud fluff.” The cake has a surprisingly light and smooth texture that I just want to savor. My family is going to flip when they taste it.